Enjoy the Spirit of Classic Motorcycles. 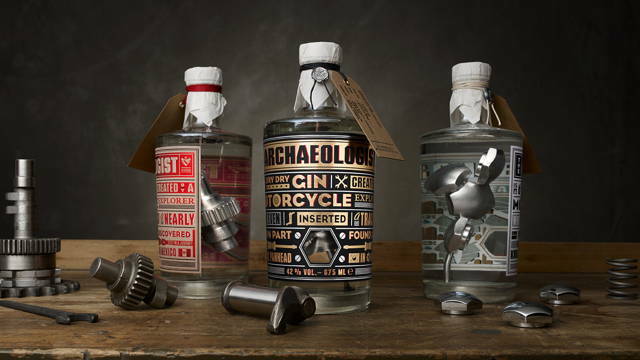 The Product Design and Packaging Design of the Premium Dry Gin “The Archaeologist“ is the first spirit of its kind. Thus, it’s filled in bottles together with original engine parts of legendary Harley Davidson bikes Uwe Ehinger has discovered as motorbike archaeologist someplace over the world. 1939 Flathead camshafts from the Mexican desert, 1947 Knucklehead screw-nuts from Chile or 1962 Panhead rocker arms from South Korea. To each of these iconic machines, Ehinger dedicates a very own sort of tribute Gin. We‘ve bottled it together with the machine parts and labelled each bottle with the mind-boggling story of the part’s origin. Every element of the hand-made packaging consists of colours and materials that were already used in the 30s and 40s.